What a great opportunity I had to take Travis and Heather Weatherston (Recently married) and father of the groom David (who was a big help) out fishing to the Landcut. This was my first trip out to the Landcut in 2 years, so I was hopeful for a good day. We started out the day catching a lot of "hard heads" which was somewhat surprising for the landcut. 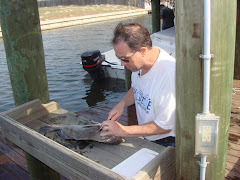 We were using live shrimp with fish bites for bait. This was Heather's first time ever fishing so it was incumbent of Travis, David and I to show her how fun fishing is! 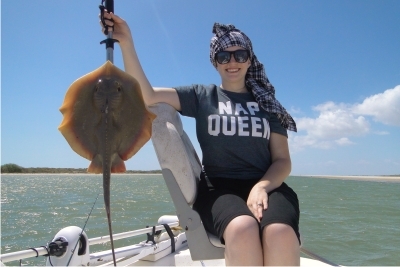 Catching a stingray is really a lot of fun for beginners. They give you a good fight and it's a unique novelty fish that everyone seems to know intuitively the danger in handling properly so as to not get barbed. I use to keep these and throw them in the freezer for shark bait on a later day. We took the barb off for a souvenir and let it go. Nice looking skip jack! 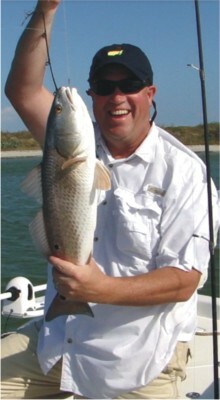 Another fish we usually consider as a nuisance fish because they don't fall under the sought after game fish. These skip jack's do give a nice fight and they jump in the air like crazy. Perhaps they're as aggressive as the much larger Tarpon's. Finally we found the right spot and got into some game fish. 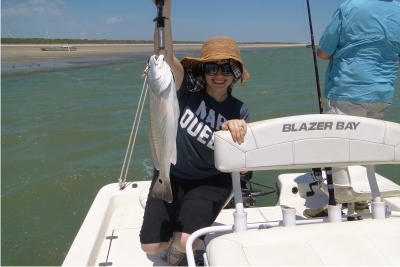 Heather pulled in this nice 21 inch redfish using just fish bites. 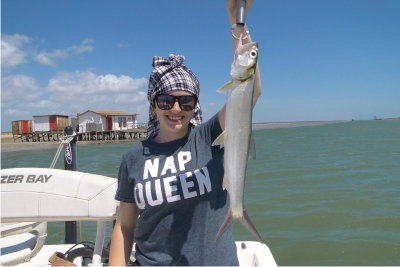 Overall, Heather caught redfish, black drum, stingray, skip jack, hard head, and dog fish. She basically caught most all the fish today. Her rod & reel were very busy! Doesn't that look like a match made in heaven! The newly weds that is... not the fish! I believe they certainly have all the makings of a real power couple! Y'all come back now, ya here! Catch some of Travis' previous fishing trips: Pull benders. Had a chance to take our grandkids fishing here in Corpus Christi. 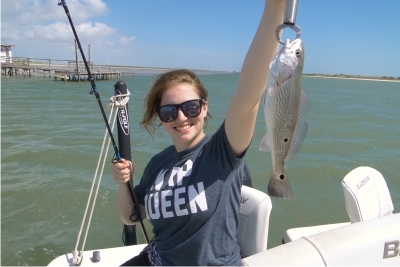 With 4 kids on the boat we planned on having time for just a few hours and give them a taste of what fishing is all about in South Texas. Picked up some live shrimp at clems and poles rigged for the bottom we were on our way. First stop was the ICW and fish the drop-offs. It didn't take long for the fish to strike! Both Breyton and Evie caught a couple nice redfish with their first cast! 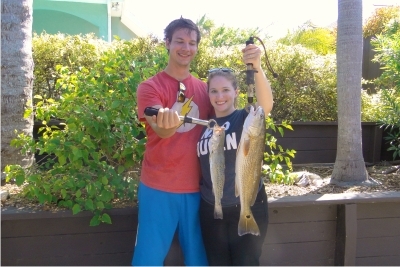 Evie caught a 19 1/2 inch redfish, while Breyton pulled in a 17 incher. Both are undersized and returned to the water. But these fish were almost as much as they could handle. Emmitt caught a mangrove snapper. Seemed unusual to catch this little guy at our location. 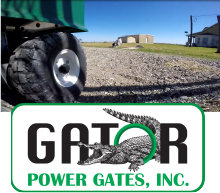 I see these over at the Packery Channel usually. 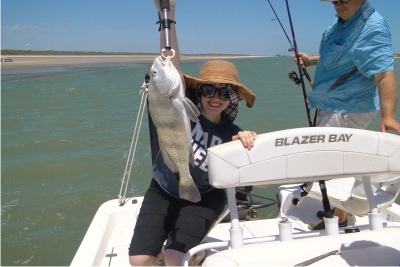 Jordan tied Evie with his 19 1/2 inch redfish for biggest of the day. Emmitt pulls in this 19 incher just before we finished up for the day. It was a nice couple hours on the boat and everyone caught fish! Next stop was lunch at Snoopy's and Ice Cream at Scoopy's.